In an effort to broaden awareness and understanding for the red wolf recovery effort in North Carolina and the implications of U.S. 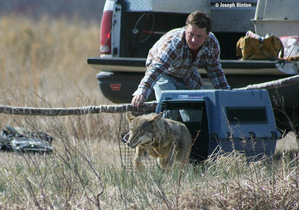 Fish and Wildlife Service’s proposed rule seeking to significantly change the size, scope, and management of the current red wolf recovery program in the state, the Wolf Conservation Center is extending a free webinar with Joseph Hinton, Ph.D. on Wednesday, July 18 at 6pm (EST). An email with further details about participating will be posted by Monday, July 16. The WCC hopes this educational opportunity inspires public participation during USFWS’s public comment period on the proposed rule – the comment period ends July 30. On June 28, the USFWS announced a proposal that will no doubt result in the extinction of red wolves in the wild. Today, fewer than 30 wolves remain in the wild. Beyond reducing the red wolf recovery area by nearly 90% and limiting the wild population to just 10-15 wolves, USFWS, the very agency charged by federal law with protecting endangered species, will allow people to kill red wolves who stray beyond the newly-designated recovery area – and without any repercussions. There is a perceived notion that red wolves are a local or regional issue and that only the residents of North Carolina are impacted by the results of this recovery effort. Endangered species recovery, however, is a matter of pride and concern for all U.S. citizens. This is not an isolated issue for North Carolina. By succumbing to political pressure, the USFWS is allowing a small group of vocal landowners to dictate endangered species policy instead of adhering to proven scientific principles and practices. You can read more about the proposal—including the options that the USFWS considered but did not choose—in the Draft Environmental Assessment. Suggested talking points (please personalize your message, if possible) found HERE.